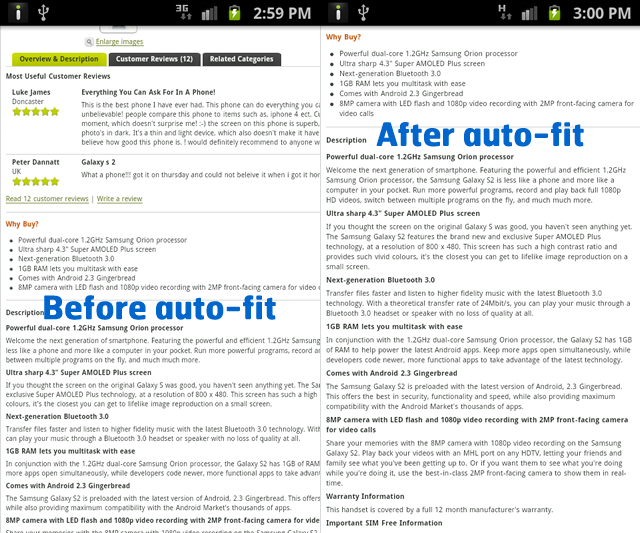 Welcome Â to part 3 of the Samsung Galaxy SII Hints & Tips Article from ourÂ guest columnist William Judd from the Mobile Fun blog. In the third and final of a series of three blog posts, he talks you through 5 more tips to get the most out of your fantastic Samsung android phone! Remember, some of these may work on your non-Samsung phone, so be sure to give it a read!If you missed Part 1Â or part 2Â be sure to check those out too! The Samsung Galaxy S2 includes a rather cunning solution to the problem of choosing the right zoom level for reading text on web pages. If you enable the 'Auto-fit' option in the Internet settings menu, you can double tap on a piece of text to have it automatically zoomed in, and re-flowed so that it fits precisely within the space of the screen. You can see it in action below; before the auto-fit the text runs off the screen, and afterwards it's gently shepherded and wrapped, making it easy to read it all without having to scroll around. You can create folders on the home screen by pressing Menu then Add then Folders. Once you've done this the menu at the bottom of the screen will appear. You can add a new empty folder, or one dynamically filled with useful items. To add applications to the folder, just drag them from the applications window to the folder on your homescreen. 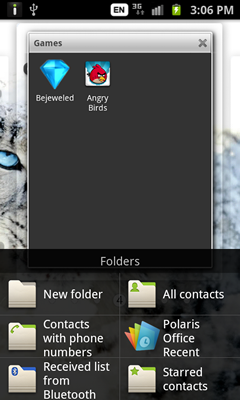 It's also possible to create folders inside the applications window itself, in order to more easily keep it organised. To activate search on the S2, which lacks a hardware button, just hold down the Menu button for a second or two. To get to the next keyboard space whilst typing, just swipe to the right. For example, if you're on the QWERTY keyboard, you'll change to the numerals and symbols space. Go SMS Pro is a free SMS application for Android. It comes with a nice selection of themes, tons of settings on all topics (as you can see on the rightmost third of the screenshot below) and quite an easy-to-use interface. Best of all, when you get a text it produces a notification window. The window has a text input area, meaning you can reply to the text without having to exit the application you're currently using. You can see this below. In the first screen, the notification is displayed. You can immediately reply, delete it, or add it as a to-do. If you type a reply, the keyboard appears. If you'd like more space to write, you can tap the arrow about the 'Type to reply' input area to get the third screen, which also allows for the inputting of smilies and audio. 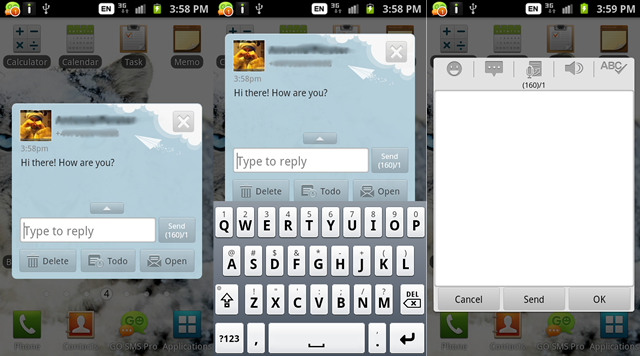 Overall, it's a well rounded package and one that presents a substantial improvement over the default SMS application. Be sure to subscribe to our RSS feed, or better yet install our android app to make sure you don't miss part 3 of this guide! I hope this has been helpful. If you'd like more, check out ten more tips at my regular home, the Mobile Fun blog. 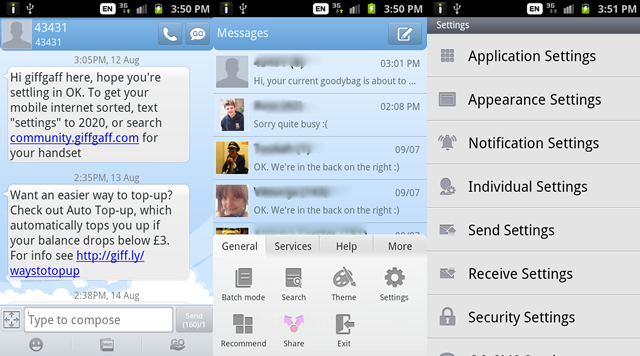 If you've got your own tips and tricks for the Samsung Galaxy S2, why not let us know? If it's a good tip, we'll be sure to feature it in an upcoming blog post. I'm also your go-to resource for anySamsung Galaxy SII accessories advice, including how to pick the best Samsung Galaxy S2 case. You can get a hold of me via Facebook, Twitter or Google+.